How to make Mixed Bean Sprouts at Home. There was a time I used to buy mixed bean sprouts or mung sprouts from outside. And it used to happen, that the sprouts would spoil despite being in the fridge and its expiry date had also not elapsed. I deduced the reason for this occurrence must have got something to do with the water used for soaking the legumes. Thus I decided to sprout the beans at home. Even today, I never buy sprouted beans from any grocery store and markets. One never know what kind of water is used. Is it clean or not? At least, in India one cannot be certain about these things. Some days back, I had blogged about sprouting mung beans at home. 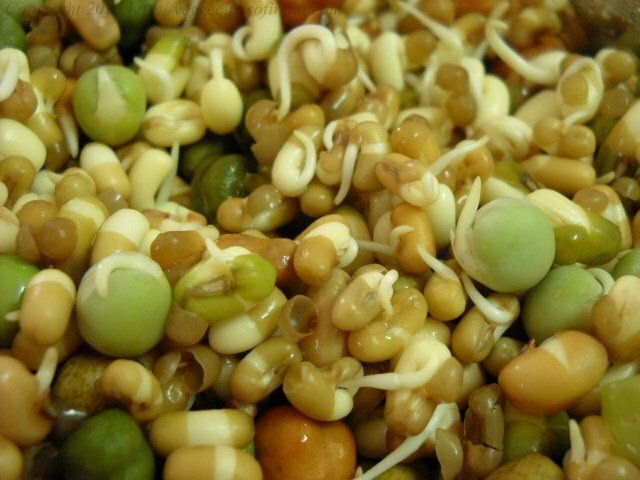 Sprouting mung beans is easy… very easy and they sprout quickly too. The same thing cannot be said about other beans. 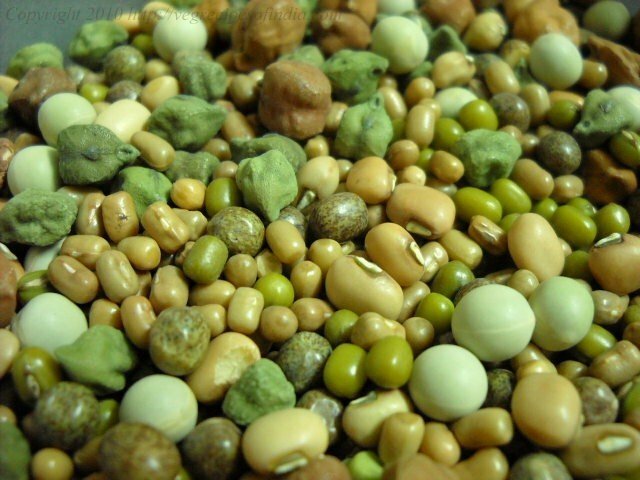 Some beans like garbanzo beans, black chickpeas, green chickpeas, black eyed peas, green peas, black peas take a longer time to sprout. I had taken equal mixtures of the above mentioned beans plus mung and moth beans. The mung beans and moth beans sprouted quickly but the for the other beans the sprouts were yet to be seen the next day. On the third day the sprouts were seen and some of them were pretty visible whereas a few of them were tiny. But nevertheless I cooked the beans on the third day. 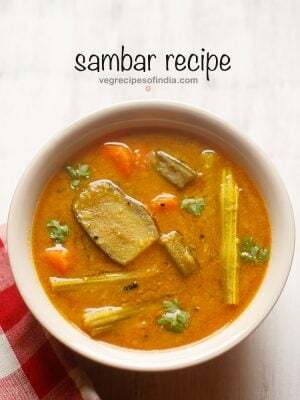 You can make variety of dishes using them like mixed sprouts curry. Pick and clean the mixed beans. Wash the beans for 3-4 times in clean water. In a big bowl soak the beans with the water covering 1 inch above the beans. Soak the beans overnight. Next day, discard the excess water from top. Cover the bowl and keep it undisturbed. Check the next day to see if the sprouts are visible. If yes and you want a little longer sprouts, than cover and keep undisturbed. Do not toss or turn the sprouts. Just see and close the bowl with a lid. Check the third day and if you are satisfied with the sprouts then do not keep the bowl again undisturbed. You can use the sprouted beans right away. Check the third day and if you are satisfied with the sprouts…. like I was……. Then do not keep the bowl again undisturbed….. 🙂 You can use the sprouted beans right away. 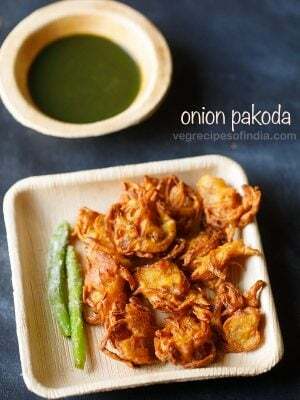 Dish up a salad, chaat, sabzi, cook up a soup, or add them to your pasta…. 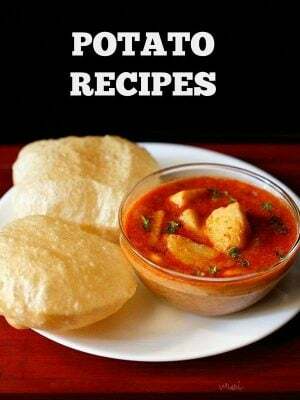 be creative and cook up a nice dish. For me, I made a spicy coconut based Indian curry known as usal with the sprouted beans. 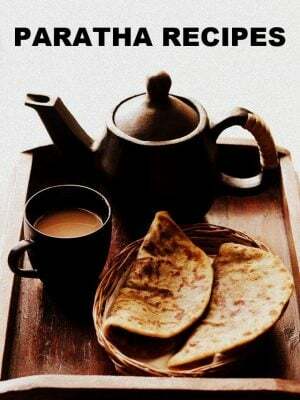 Hiii I m new at this can u tell me the Indian name of saprount and is it easy in punjab to get falfala. i do not know what is saprount. by falfala do you mean alfalfa. Welcome Siddhu. It happens at time. Yes you can use them. Or you can keep them in the fridge for 1-2 days and the sprout will keep on growing. a tea towel. some circulation of air is better. craig, a warm place does help. the place should be warm but dry. it won’t make the sprouts ferment. but just make sure that the place is not hot. I hav sprouted green chana and they have come up really well. They are still hard thou. I did the method whithout the cloth. 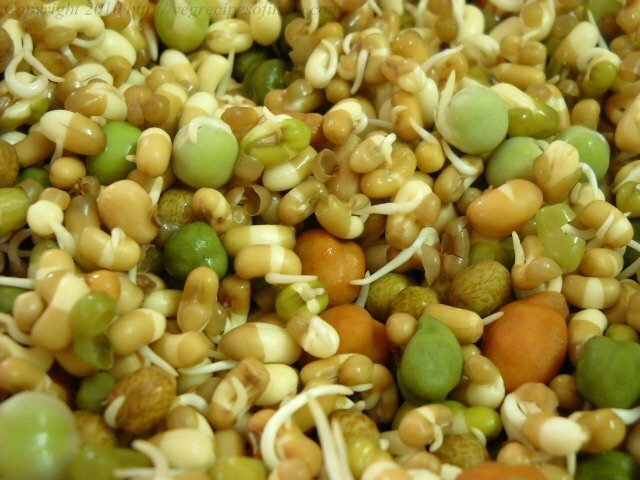 Normally i have been told you can eat the sprouted channa raw direclty. How to make them soft? Should i put more water next time or soak them longer? 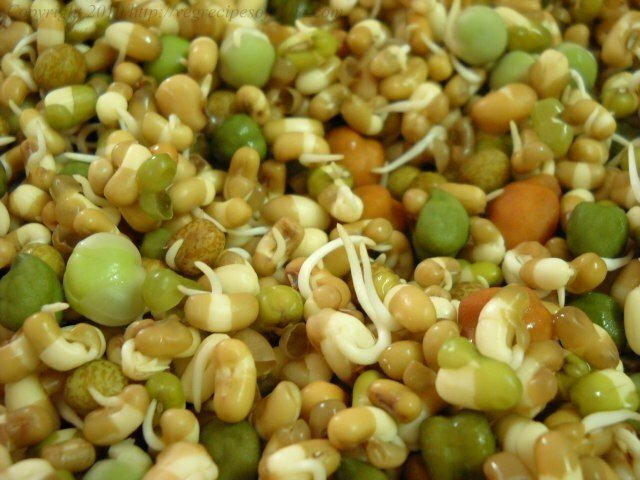 sprouted chana is crunchy after you soak them. soak for a longer time, at least overnight. once they soak well, then they are not hard. So I am new to this..but can you eat the beans just as they are sprouted..or do you need to steam them/cook them before you should eat them? Will they upset your stomach? 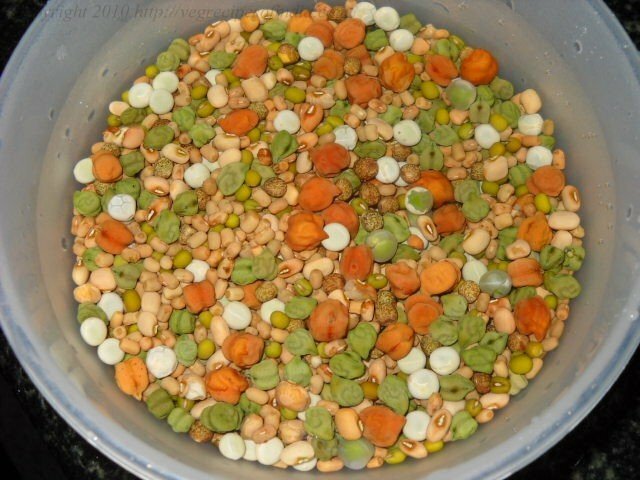 since these are mixed beans, its better to cook them. otherwise they will upset the stomach. if just mung bean sprouts, then you can have them raw. That’s great thanks! How long do you have to cook them for? They they just be lightly steamed? I like to eat mostly raw but I am fine to steam things lightly here and there. 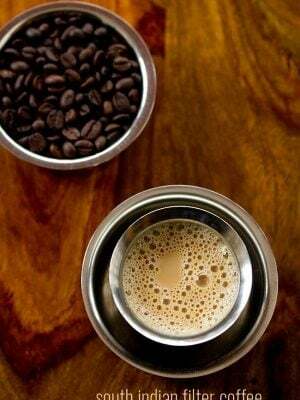 you have to steam them till they are completely cooked as black chickpeas, green chickpeas, white chickpeas and black eyed peas are used. mung or moth bean sprouts are fine to be lightly steamed bu not the above mentioned bean sprouts. i usually cook in a pressure cooker, so it takes about 8 to 10 mins to cook them. in a pot, it would take about 20 mins or more. We can supply you Alfalfa seed please call me on +91 9924290884.
thanks jaimin. i easily get organic alfalfa seeds here. approving your comment so that readers can contact you. 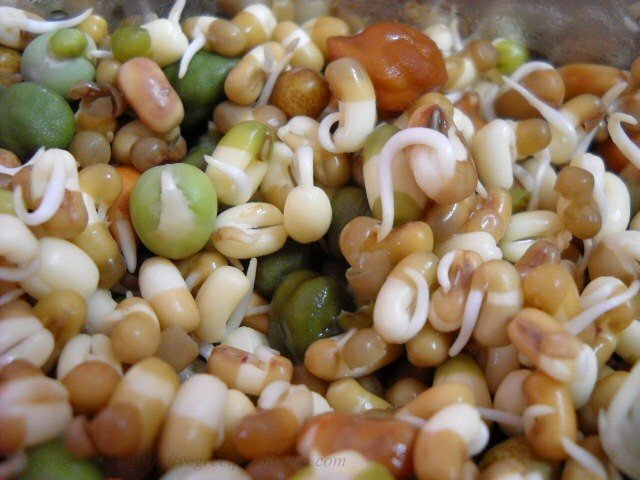 Can you give us a recipe for sprouted beans?And can you tell me what beans you have in the photo? 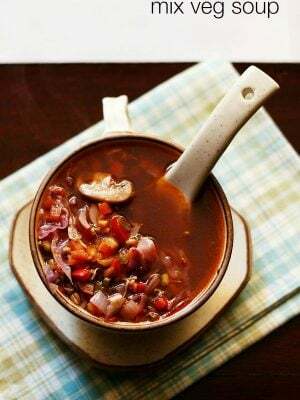 there are many ways you can make sprouted beans. 1: lightly steam and add it too your salads. 2: you can also make simply stir fries with the sprouted beans. 3: top it sandwiches, burgers, with the sprouted beans. 4: make a simple rice dish with the beans. 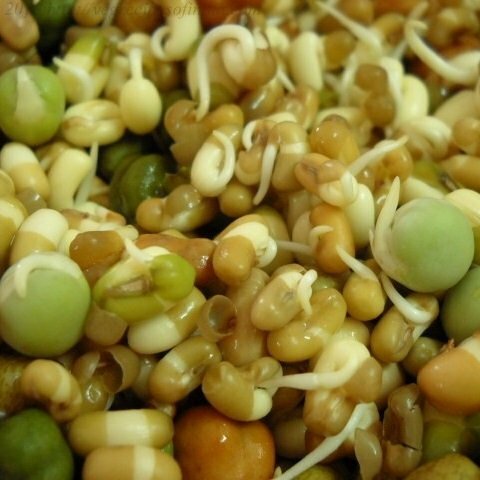 there are many ways you can incorporate sprouted beans in your diet. alfalfa is called as rajko in hindi. 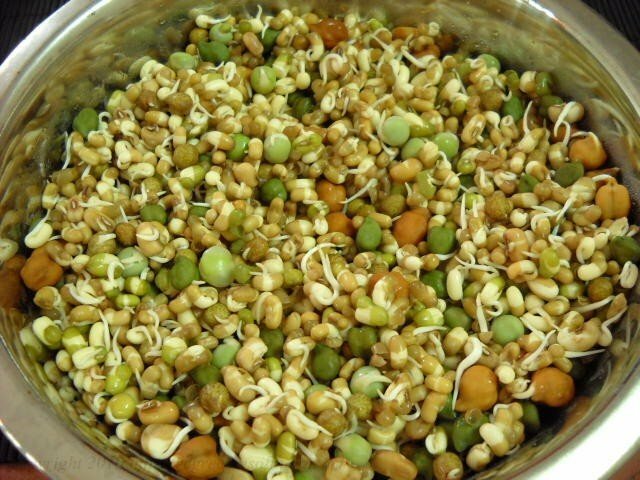 in mumbai you should be easily get alfalfa seeds. if i can get it in goa as well as bangalore, mumbai should be easy. check out the organic section in any big hypermarket like hypercity, spencer’s etc. conscious food which deals in organic food, has a pack of 200 gms of organic alfalfa seeds. most of these large supermarkets keep conscious food’s organic stuff. also check out fabindia’s organic stuff. i think they also have alfalfa seeds. I want to know how much calorie i can get in sprout and if i want to have 3000 calorie by sprout it self the how much beans i should have to use for sprout? i never bother to check how many calories any food or recipe has coz it doesn’t concern me. hope its helpful to you. Thanks for the information. And what kinds of bean is the orange beans they are kind of big?